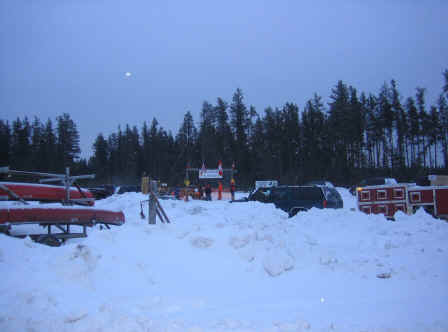 This was planned to be the first of many races on snow in 2005/06, as it turned out it was to be our only race of the winter. Preparations had been hampered by a complete lack of snow in Nova Scotia and the fact that our van spent the entire winter in the garage being 'fixed' and so our training options had been very limited. 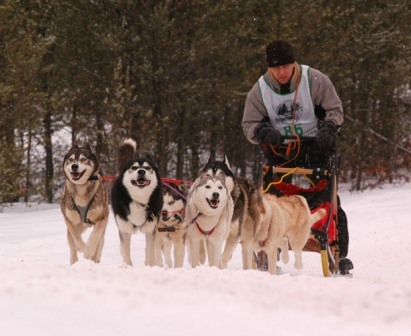 Nonetheless we hired a van, filled it with as many cages and airline crates as we could, slid the sled in there somehow and made the 32 hour drive across to Michigan determined to do what we had come to North America for, race our dogs. I have to confess at the outset that I must be somewhat naive because when I saw on MapQuest that Shubenacadie, NS to Newberry, MI was going to take in the order of 25 hours to complete I dismissed it as 'Oh that's only a day, no trouble'. I failed to appreciate the size of North America and the fact that this is in fact 25 solid driving hours, add in the need to get gas, drop the dogs, feed ourselves and the guys, oh and catch at least a couple of hours sleep and it turned into a marathon journey (our previous longest journey was Helston to Fort William in the UK - a mere 13 hours). days leading up to the drive west trying to teach the dogs to Gee Over on command (with little or no head on passing in the UK races this is an order we had never taught before). The good people living around our then main training area at Musquodoboit Harbour, NS must have thought I was rehearsing for Monty Python's Life of Brian The Musical shouting incessantly for the dogs to "Gee Over, Gee Hovah, Jehovah". Furthermore there was also a sizable purse in place so competition in the race could be fierce, not that there was any hope that I would win but the last thing I wanted to do was get in someone's way and stop them from winning. 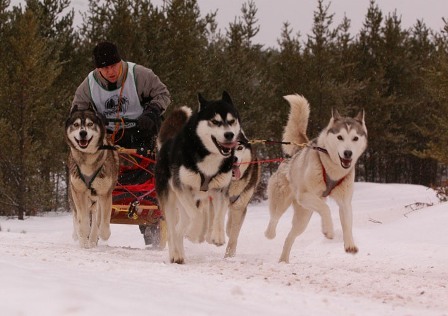 My utmost main concern though, and the one that was causing most sleepless nights, was of course the fear of falling off the sled and losing the team in full view of everyone at the start line. Back to the musher's meeting - one after another, people got up to brief: organisers, volunteers, marshals, timers, sponsors and finally the Trail Boss and his assistant who announced that the trail was in excellent shape...oh except for one really rough section where mushers should hold on tight. And where was that section? Only the first 1/4 mile, right in front of the start - that really eased my fears, the dogs will be going mental, I will be having a big enough struggle just to stay upright and now the trail is really rough!! Trying to hide my ever growing nerves we grabbed a bite to eat, wandered around the mushers market, checked out the silent auction and then went and elicited the help of all and sundry to dig/pull the van out of the car park. How I wished we were back in the UK running at Sherwood Forest. 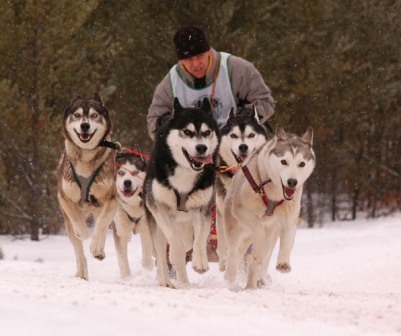 The race start isn't actually in Newberry but about an hour north in the forests on the edge of Lake Superior, so after a pretty sleepless night we arose at 0500 to get the dogs ready and begin the trek over snow covered roads; all teams had been advised to be at the race site by 0700 to allow time for a 0900 start. When we pulled into the car park we were directed to our parking slot. In the US you park according to race number the idea being that you actually hook your dogs up at your vehicle then volunteers come around to each starter in order to help lead the teams to the start line. Considering the size of the teams involved this is much more practical than what we were used to, leading the dogs to the start and then hooking up in the start chute as the two minute count down progresses. We had about three hours to spare before my start time so we wandered around getting more nervous, looking at the wide variety of dogs on show from Alaskan's to hounds and seppalas to red setters. This was the first time that we had been to a non-purebred race so this was another new experience for us. As start time drew ever closer I began paying close attention to everyone around me who all seemed pretty industrious, hoping to pick up tips on how to prepare. Then before we knew it the mandatory equipment was being checked, lines stretched out and time to hook up the 6 dog team. We were running the combined two three dog teams from the UK (my reasonably fast team and Louise's very slow team) so we knew we weren't going to set any speed records. Noisy however we were going to be! As the routine of hooking up at the van and leading the teams to the start takes a lot longer than what the dogs were used to their cacophony seemed louder than normal - I saw one of the helpers leading our team turn to a friend and complain that the team were very active for a purebred team - I am not sure if that was intended as a compliment or complaint. Louise, on to the runners, stow the hook and the sled lunged forward and we were off. clawed my way back onto the runners (the dogs now decided it was time to pursue the teams that had overtaken us) I noticed some of the marshals running down the trail towards us; I managed to half heartedly wave them away and we set off down the trail again. As we rounded the next hill I was greeted by the sound of dogs fighting in the distance, I guess another team was suffering the same ignominy at the hands of this dog. translates to "Boy, you have a slow team there and I can't think of anything better to say about them". I also managed to avoid getting passed by any of the 12 or 8 dog pro teams (well the leader of the 8 dog class did overtake me in the No Right Of Way coming up to the finish but managed to avoid impeding her progress at all (I think) and hell so close to the finish doesn't count. There was one other minor incident. At about the 17 mile mark the trail really opens up and a long relatively boring stretch of trail ensues. By this time I was pretty exhausted and was kind of slumped over the handlebar, resting. As I looked up there was a photographer right in front of me snapping away merrily at the most pitiable sight that I was portraying - needless to say those were some races pictures were didn't buy! Not a significant event I must admit but it did amuse Louise so always worth a mention. we returned to the hotel for a much deserved, and very long, sleep. Friday evening. Turns out he was initially reluctant to help because he thought with our unusual mode of transport and even more exotic accents we were from the media?! He was actually an extremely nice guy, spends the summers training horses in the southern states and comes north in the winter in search of kennels looking for winter handlers - a bohemian lifestyle I could definitely embrace, although not so much the horses! We decided that all in all we had had such a good weekend (even including the last place) that we would endeavor to return the following winter. Even the journey home wasn't that bad, I decided to forego sleep (all bar two hours just outside Montreal when the choice was pretty much sleep or die) and we got home in a little over 27 hours - such fun.